One of the biggest challenges faced by those who tow is seeing clearly and knowing what is going on at the rear of the outfit. In fact, many drivers will not tow because they are worried about their ability to hook the trailer up to the tow vehicle and maneuvering their vehicle and trailer when they need to reverse. This is understandable, and in the past you would have had little choice but to practice for hours before you could master these two very important skills. However, new technology has come to the rescue. Today, seeing what is going on behind your vehicle and hooking up is far easier. All you need to do is to equip your tow vehicle with towing mirrors and a reversing camera to make two of the most daunting towing tasks super easy. As the name indicates clip on trailer towing mirrors fit over your existing wing mirrors. They effectively double the amount of mirror space you have. Because they stick out further than normal you can see past your trailer or camper, even if it is wider than your tow vehicle. From a safety point of view, the more of the road you can see, when towing, the better. Without an adequate view of what is going on behind you, it is all too easy to have an accident. Especially when joining a freeway, or turning. Add in the fact that good towing mirrors make reversing far easier, and safer, and you have two compelling reasons to invest in a pair. They are easy to fit, and are not expensive. Given the fact that they could save you from having an accident, towing mirrors are a very good investment. Universal clip on towing mirrors are among the cheapest you can buy, but they do an excellent job. The pair we feature here are designed to fit any type of wing mirror, up to a height of 11 1/2″. Fitting them is easy. You just have to ease the straps over your existing mirror, and use the ratchets on the straps to tighten them. This means that they will stay in place in all weather conditions. The inclusion of rubber pads to protect the paintwork on your vehicle’s mirrors is a nice touch, and something you do not see on all universal clip-ons. For towers, cameras solve a multitude of problems. Using a rear view camera makes it far easier to park your vehicle and trailer, and provided you buy the right kind, can make hooking your trailer, horsebox or caravan up easy. So easy that you can even do it when you are on your own. An example of a rear view camera that can also help you to hook up your unit is the Hopkins Smart Hitch Backup Camera. Superimposed on the monitor system, which shows you what is behind you, are a set of colored lines. These SmartZone lines enable you to see how far away from an object you are, and easily work out what direction you need to steer. There is also a beep, which tells you how close you are to objects. There are two modes. One is designed to make it easier for you to fit your trailer and vehicle into a parking space. The other mode allows you to complete the hook up process without the need to have someone stand behind your unit, and guide you onto the towing ball. This reversing aid is easy to install as well as intuitive to use. All most owners will need to do is to mount the camera behind the license plate, and plug it into the tow pack. The monitor is then mounted inside the cab. It is important to note that this is not a wireless rear view camera. The camera has to be connected to the 3” monitor via a cable, which should ideally be run inside the vehicle. This may sound like a lot of trouble, but a hardwired connection ensures that the image is always clear. You do not see any annoying flickering lines that are an issue with many wireless rear facing camera systems. If you would like a bigger monitor, this package made by Rear View Safety comes with a 7” monitor. It is one of the most robust reversing camera packages available. The weatherproof cameras provide a 130-degree view of what is behind your trailer. The fact that the whole system has an IP68 rating, and has the highest impact rating in the industry (20G), makes it a good option for adventurous travelers who like to get off the beaten track. Reversing at night can be challenging. 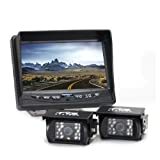 Unlike many other models of rear-view trailer cameras, these are infrared. This means that you do not have to rely on the light cast by your reversing lights to see what you are doing. There are two cameras included in the package. Most people opt to install one at hitch level to help them with the hitching up process, and the other higher up to help with parking. If you want to incorporate a side view camera into this setup, you can do so. It also has good audio. In theory, you do not need this. However, being able to pick up the sound of kids playing behind you is handy. It alerts you of their presence, so you are aware of the possibility of them running behind you as you reverse. Investing in technology that helps you to see more of what is going on behind your vehicle really does make sense. It gives you a better view, helps you become a more confident tower, and definitely keeps everyone safer.